The French Legation house, now located east of I-35 on 802 San Marcos Street, is the only structure a foreign government has erected on American soil. Built in 1840-1841 at the commission of Monsieur Jean Pierre Isidore Dubois de Saligny, chargé de affairs for the French government in Texas. After Dubois de Saligny left Austin and Texas became a part of the Union, the house passed into the hands of the Robertson family, who held it until the mid-twentieth century. The house stood amidst the waves of immigrants who settled in the area surrounding it, from Swedes and Germans near the turn of the century to Mexicans and African Americans a few decades later. Now, the French Legation acts as a museum which preserves the original style of the time period of the Texas’ early beginnings as a Republic. During the mid-nineteenth century, the period of rapid American expansion towards the west, the Republic of Texas claimed sovereignty over its own territory between the United States and Mexico. In 1835, Texan colonists in the Mexican interior revolted against changing governmental policies. By early 1836, the Republic of Texas declared its own constitution. United States President Andrew Jackson recognized the independence of the new Republic the following year and in 1839 King Louis Philippe of France sent an emissary to the frontier nation on an exploratory mission. This diplomat, Monsieur Jean Pierre Isidore Dubois de Saligny, recommended open relations with Texas, especially considering its resources of cotton, a commodity in short supply in France. On September 25th of that year, King Louis recognized the independent Republic of Texas, signing a Treaty of Amity, Navigation, and Commerce. Dubois de Saligny, a former secretary in the French legation in Washington D.C., took his time reporting to Austin to fill his new position as chargé d’affaires. After a vacation stop in New Orleans, he arrived in the capitol city, then a collection of log cabins and dirt roads, in September of 1840. He was not impressed with his new Texan surroundings and Texans were soon not impressed with their new French diplomat. Not long after his arrival, Dubois de Saligny gained the reputation as a swindler and a cheat, accused of producing counterfeit bills to pay his bills. During 1841, Dubois de Saligny was pushing to pass an agreement between France and Texas that would allow French explorers and settlers to colonize a portion of West Texas. At first, Texans were receptive to this Franco-Texian Bill, but their perception of it soon soured with along with their regard for the French diplomat. Dissenters argued that both Dubois de Saligny and the country of France would profit from the passage of the bill. Dubois de Saligny did not help his case when he engaged in a conflict with an inn owner. This conflict, now termed the Pig War, further ruined Dubois de Saligny’s reputation with Texans and in mid-1841 Secretary of State James Mayfield sent a letter to Paris requesting the diplomat’s removal. Before the letter reached Paris, however, Dubois de Saligny took the hint, packing up and leaving Austin for good. He remained in his position as chargé d’affaires, but acted mostly from New Orleans until 1846, when the Republic joined the United States of America. When he left Austin, the chargé left behind his residence on the east side of the city, still under construction at the time. In an effort to live in the most luxurious way possible, Dubois de Saligny had commissioned the erection of a mansion on a hill in the middle of twenty-one acres of purchased land. The house, designed with a blend of Greek Revival, then a popular American style, and Mississippi Valley French architecture, could accommodate the guests and dinner parties which Dubois de Saligny envisioned. Builders constructed the residence from Bastrop pine, a “fine-grained lumber found nowhere else in the world,” as if it were in the French Caribbean rather than on a Texas hillside: they raised the house two feet off the ground and added Greek columns to the front veranda. Dubois de Saligny probably never took up residence in the French Legation house, however, because of its unfinished state at the time of his departure. He sold the house to the Catholic Diocese in late 1840 on the condition that he could remain in it, if he so chose, until mid-1842. By the time that the diocese gained full possession of the house, the Texas capitol had moved to Washington-on-the-Brazos and Austin’s population was suffering the consequences. When the Republic agreed to terms of annexation with the United States in 1947, Mosely Baker, a hero of the Texas Revolution, bought the house and in turn sold it to a Dr. Joseph W. Robertson. Robertson and his wife, Lydia Lee, planned to create a school for girls within the mansion on a hill, but their plans fell through within a semester or two. The Robertson family then moved into the house and Mr. and Mrs. Robertson raised eleven children on the property. 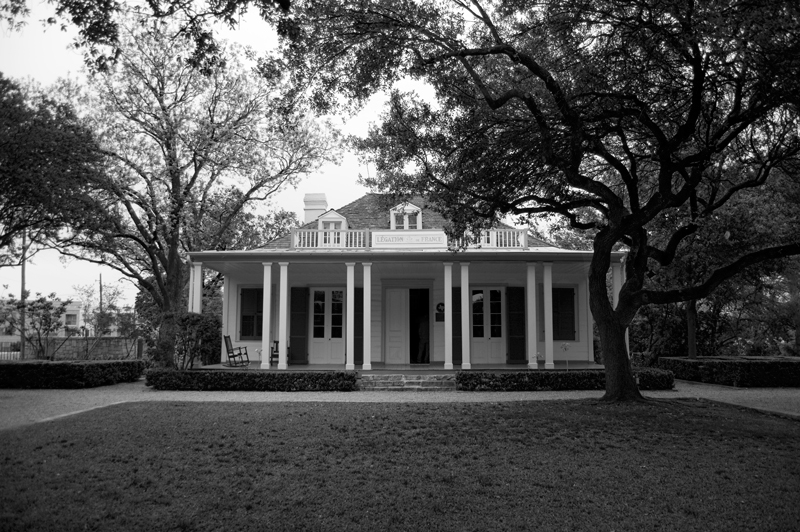 Members of the Robertson family remained living in the house until they sold it the State of Texas in 1940. Nine years later, the State of Texas bought the house from the Robertson heirs and put it under the care of the Daughters of the Republic of Texas. 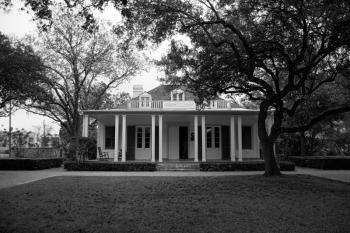 In 1956, the Daughters opened the French Legation Museum, which remains in operation today.